I’m not generally a fan of short stories. They tend to leave me unsatisfied. Fortunately, The Curiosities: A Collection is so much more than just a book of short stories. 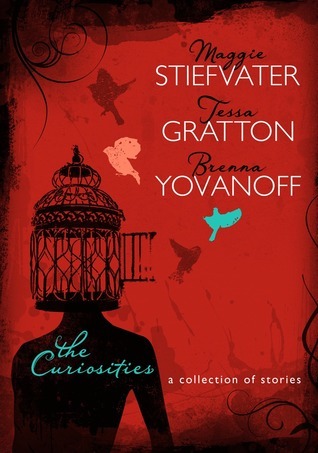 The tales grew out of Maggie Stiefvater, Tessa Gratton, and Brenna Yovanoff’s collaboration as The Merry Sisters of Fate, a blog where they write in response to a common prompt and post on a deadline in order to challenge themselves creatively. Rather than edit these experiments when they decided to publish them in an anthology, they instead shared them as is, with handwritten notes that offer a window into their writing process. The personal annotations show the reader a glimpse into the interplay between these authors as friends and critique partners. Often humorous and always insightful, the drawings and inside jokes in the margins are what set this book apart from other collections of paranormal young adult stories. Asides within the collection such as “Stories as Novel Playgrounds” explain the author’s writing process, from world-building and character development to how plots come into being. A casual reader might not realize that three of Brenna’s stories, “The Bone Tender,” “Girls Raised by Wolves,” and “Power of Intent” are all set in the same story world, but this knowledge makes the experience of reading them that much richer. There’s also practical advice for writers who are stuck on how to end a story; these authors suggest killing someone (or everyone), burning things down, or kissing. Even if you’re not interested in the writing process, the collection is worth a read. The stories are delightfully morbid, often funny, sometimes scary, and always entertaining. Tackling everything from vampires to zombies and transporting the reader from modern-day high schools (for gods and goddesses) to burial mounds in ancient Sweden, each story is ultimately about a character’s coming of age, with plenty of magic (and kissing) sprinkled in along the way. Brenna Yovanoff typically favors macabre horror rather than magic and fairy tales, but two of my favorites from her demonstrate her ability to do them well. “Cut” was inspired by the stepmother from the classic fairy tale Snow White, and starts off like this: “My mother cut my heart out and put it in a box.” The twist is this evil stepmother wears Dior eyeshadow and Manolo Blahniks and really doesn’t cut out her daughter’s heart—she cuts her hair. In “Lazarus Girl,” the heroine isn’t the damsel in distress that populates many fairy tales, but a girl who is not waiting to be rescued or even rescuing herself. Zombie stories are hard to get right, in my opinion. Maybe it’s all the cheesy movies I’ve seen, but I just can’t help but get the feeling that it’s all been done before. In “The Deadlier of the Species” Maggie Stiefvater strikes the perfect balance of horror and humor. With dialogue that sounds so much like teens, believable invented pop culture references, great suspense, and just the right amount of gross, this was my favorite story of the collection. You won’t look at a puddle or a bottle of water the same way after reading this story. Though all three authors write for young adults, this is a collection that features both teenagers and college age students as protagonists, and the stories can be enjoyed by readers of all ages who enjoy a dash of darkness in their fiction. Prior to reading this collection, I hadn’t read any of the authors’ popular young adult novels, but each story made me curiouser and curiouser to check out their longer works. Note: I received this ARC from one of the authors because we are hosting The Merry Sisters of Fate at a library event. A similar review was posted on our library website. The stories themselves were fun, but it was really the drawing and notes and inside jokes that really drew me in. It’s more a collection for writers than readers. I know we have that Let It Snow collection at my library, I’ll have to check it out.